US Defense Secretary Jim Mattis, who has enjoyed a level of bipartisan support rarely seen in Washington, is facing mounting public criticism amid the fallout from the slaying of Saudi journalist Jamal Khashoggi. The fresh scrutiny of Mattis, often portrayed at home and abroad as a trusted steward of US values during the turbulent times of President Donald Trump, comes on the heels of his implementation of a controversial military order to place troops on the US-Mexico border, a move critics slammed as a political stunt. The most vocal attack on the former Marine general came from a member of Trump’s own Republican party this week, when Senator Lindsey Graham blasted the Pentagon chief and Secretary of State Mike Pompeo for refusing to directly link Saudi Crown Prince Mohammed bin Salman to Khashoggi’s murder at the kingdom’s Istanbul consulate in October. Mattis has repeatedly condemned the killing and called for those responsible to be held to account, but insisted he had seen “no smoking gun” connecting Prince Mohammed to the Khashoggi murder. “You have to be wilfully blind” not to conclude the murder was orchestrated by people under Prince Mohammed’s command, Graham said, following a briefing to several senators by CIA Director Gina Haspel. “There’s not a smoking gun, but a smoking saw,” Graham added, referring to the reported grisly detail that an autopsy specialist dismembered Khashoggi’s body with a bone saw. Graham is a firebrand in US politics, and his bouts of indignation should be viewed through the prism of his own ambition. Initially a fierce Trump opponent, he converted to a staunch ally, and Washington observers say he is angling for a top posting in the administration. Still, Graham was not alone in his upbraiding. Democratic Senator Chris Murphy said Mattis and Pompeo have tried to “push aside” the question of Prince Mohammed’s involvement and said that when the two men spoke to senators last week they had sought to mislead lawmakers. They “knew that there was no way this murder happened without the consent and direction of MBS,” Murphy told MSNBC, using the abbreviation for Prince Mohammed. On Wednesday, Mattis said Graham has “the right to his own opinion” and reiterated his careful interpretation of the intel on Khashoggi’s murder. “If I say something, I need the evidence,” Mattis said. Mattis was also thrust into the spotlight last month in the run-up to the midterm elections, as Trump repeatedly attacked “caravans” of Central American migrants headed for the US border. The president ordered a deployment of thousands of active-duty troops to beef up the frontier. Critics assailed the move as a costly political stunt to mobilize Trump’s conservative base. 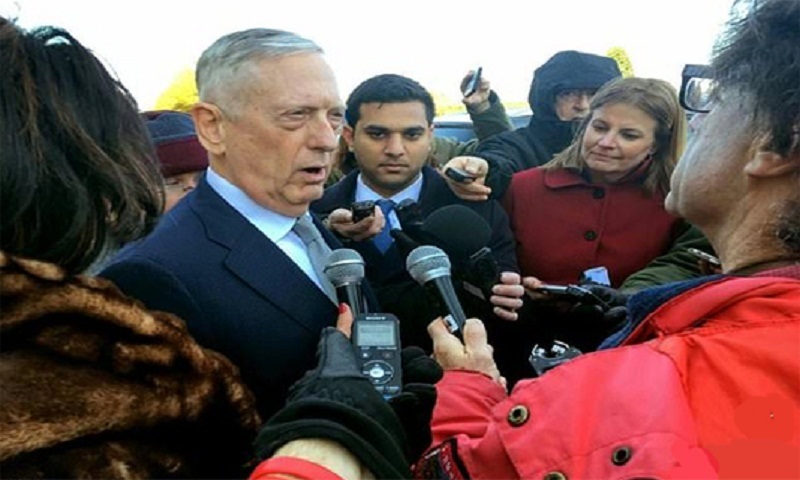 Magsamen, writing on the Defense One website, said that Mattis should either explain his support for the move or quit if he does not believe it warranted. But Mattis defended the decision, saying it was not political and that the soldiers on the border are mainly providing much-needed logistical support: “We don’t do stunts in this department,” he said. The deployment of approximately 5,600 troops is Mattis’s largest in his nearly two years at the Pentagon, and he this week approved a request from the Department of Homeland Security to extend the mission through January 2019. Saudi Arabia has sought to distance Prince Mohammed from the murder and has received unbending support from Trump, who sees Riyadh as a vital security partner in the Middle East and a key oil exporter and buyer of US arms. But US lawmakers have grown increasingly leery about American support for the Saudi-led military campaign in Yemen. A bipartisan group of senators on Wednesday introduced a resolution that, if approved, would say the Senate “has a high level of confidence” Prince Mohammed was “complicit” in Khashoggi’s killing, and would assail Riyadh for its role in Yemen’s humanitarian crisis. The Senate could also vote on a separate measure next week to force the US to end its military support to the Saudi-led coalition in Yemen. Mattis’s cautious words come at a sensitive time. He must tread a fine line with Saudi Arabia as he publicly and privately pushes Riyadh to negotiate for a peace settlement with Houthi rebels in Yemen. For his part, Trump has said “maybe he did and maybe he didn’t” when asked if the crown prince knew about the plot to kill Khashoggi. Graham suggested Mattis and Pompeo were being vague in their intelligence assessments to please Trump. “The reason they don’t draw the conclusion that he’s complicit is because the administration doesn’t want to go down that road, not because there’s not evidence to suggest he’s complicit,” Graham said.